Formulated for professional high-production, high-end detailed E F/X work. FiberGel is independently tested 40% stronger than the leading brand because it contains a patent pending duo fiber matrix. Set Time - 4-5 minutes. FiberGel stays where you put it, too. The fibers not only add tear resistance and strength, they prevent runs and drips. 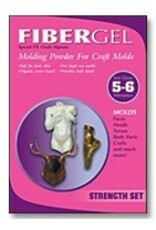 The fiber matrix retains moisture reducing shrink rate keeping your mold soft and flexible far beyond normal alginates. This allows for delayed casting times without the loss of detail. The unique formula allows an even, creamy, one-coat coverage. A thicker or thinner mix can be had by varying the mix ratio. FiberGel mixes smoothly and goes on easily and uniformly.